In the heart of our nation’s capital, with the White House and the State Department as close neighbors, George Washington University is located in the Foggy Bottom neighborhood of Washington D.C. Students take full advantage of living in the center of the city—it’s an integral part of life at GW. The sports teams are known as the Colonials, and GW’s mascot is none other than George Washington. The urban campus, home to just over 11,000 undergraduates, is centered around the Marvin Center, the mid-campus quad and Kogan Plaza where students congregate on beautiful days. Transportation: Washington, D.C. is easily accessible from either Ronald Reagan National Airport, about 15-20 minutes to campus or Dulles International, about a 40- minute drive. Amtrak, MARC (Maryland Transit Administration), and VRE (Virginia Railway Express) travel in and out of Union Station. This is also where you can find BoltBus, Greyhound, and Megabus. Inside Union Station, you can board Metrorail for a short subway ride to the heart of the Foggy Bottom Campus. Coffee: We love Peet’s Coffee & Tea, and have been known to go out of our way for their Berry Iced Tea. You can’t get any closer to The Admissions Welcome Center than the Peet’s located in The District, a new residence hall right next door to the Marvin Center. Nicknamed by students “Gelbucks", there’s also a Starbucks in the Gelman Library. Breakfast: For something fast and reliable join GW students and professors alike, at Whole Foods, right on campus. Popular at all times of the day for a quick meal, there is seating available inside. If you have more time for a more extended breakfast, don’t think twice and head to Founding Farmers. Every student we asked told us it’s their favorite place near campus for not just breakfast but lunch and dinner as well. Started by a GW graduate the emphasis is on fresh ingredients from local farms all served in a buzzy, casual two-tiered space on the edge of campus. Lunch: Housed in a historic old pharmacy owned by GW alumnus Richard Lucien Quigley way back in 1891, Tonic Bar & Restaurant, fondly still referred to as Quigley’s Pharmacy dishes up American comfort food to happy students and parents. The extensive menu has something for everyone, and best of all its right in the center of campus. Sweetgreen, started by 3 Georgetown alums, is a farm-to-table salad chain with a devoted following just a few blocks from the Marvin Center. Across from Sweetgreen, vegetables take center stage at Beefsteak, a “fast good” concept from celeb chef José Andrés'. Casual: For a fun, easy dinner after a long day touring we jumped in an uber and headed to All Purpose Pizza in Shaw, right by Logan Circle. Start off with some salumi and hot antipasti before moving on to one of the seasonally inspired pies. (This is where group sharing comes in handy!) Be sure to save room for dessert; imported from everyone’s favorite DC Bakery, Buttercream Bakeshop, just down the street. In the mood for something more exotic? Little Serow and Bad Saint are two of DC’s hottest restaurants, known for excellent Thai and Pilipino food respectively, but with a no reservations policy and epic lines, you need to be determined. More than one Washingtonian steered us towards no-frills Baan Thai where Chef Jeeraporn Poksupthong, better known as P’Boom cooks authentic Thai authentic specialties—delicious, affordable and there’s no hassle to get a table. Adam Morgan’s is D.C.’s eclectic neighborhood awash with colorful bars, music venues, and international restaurants—its no wonder students love it. Lapis Afghan Bistro, Compass Rose, Tail Up Goat, and Roofer’s Union are all excellent choices. Right in Foggy Bottom head to Rasika West End for upscale Indian food, some of the best in the city. The menu varies a little from the original Rasika in Penn Quarter, but signature dishes such as spinach chaat and black cod are thankfully on the list. Sip some sangria while grazing on tapas at Jose Andres' Jaleo.or sample some Mediterranean mezzes at Zaytinya two of D.C.’s most popular restaurants. Enjoy the gorgeous vaulted ceilings in chef, Spike Gjerde's A Rake's Progress. The Logan Circle/Shaw area is fast becoming D.C.’s new go-to neighborhood. Consider yourself lucky if you secure a reservation at French influenced Le Diplomate, or Convival. We loved our meal at The Dabney where everything is cooked over an open fire—the centerpiece of the restaurant. Without a reservation try for a seat at the bar. We put our name down with the hostess and headed to Tiger Fork, just catty-cornered to The Dabney. It's another hot spot in Shaw known for Asian Street food and inspired cocktails using medicinal herbs--who doesn't love drinks that are good for you! The Dabney and Tiger Fork are both on Blagden Alley, off 9th Street, worth finding for sure; sharing small plates at The Dabney was one of the best meals of our trip. Late Night Snacks: A ten-minute drive away, Ice Cream Jubilee –gets rave reviews thanks to creative flavors such as Banana Bourbon Caramel. Gin and Tonic Sorbet and Thai Iced Tea inspired by the owner’s international travels and love for decadent cocktails. For those more traditional--don’t worry they serve vanilla, mint chip, and cookie dough as well. Student Spotting: GW is truly a city school with the streets of D.C. serving as the university’s campus. The Marvin Center is the heart of the school and the best place to observe student life, get a coffee, grab a seat and watch GW life unfold. Students are at work on their laptops, talking to friends, grabbing something to eat. The bookstore is on the lower level if you want to bring home some gear. Local Attractions: Washington D.C. is a worthy destination in its own right, with some of the best museums and cultural attractions in the U.S. Short on time, must see monuments include The Lincoln Memorial, The Vietnam Veterans Memorial, The WWII Memorial, and the Jefferson Memorial, which is exceptionally beautiful at sunset. Two very moving museums; The United States Holocaust Museum and the newest Smithsonian Museum, The National Museum of African American History and Culture, are not to be missed. The latter, opened in September 2016, takes visitors on a journey through 400 years of African American history, an emotional and powerful experience. Extremely popular since day one, you must have a timed ticket to visit; free timed entry passes are released monthly, for more information click here. Just toured the GWU Campus? 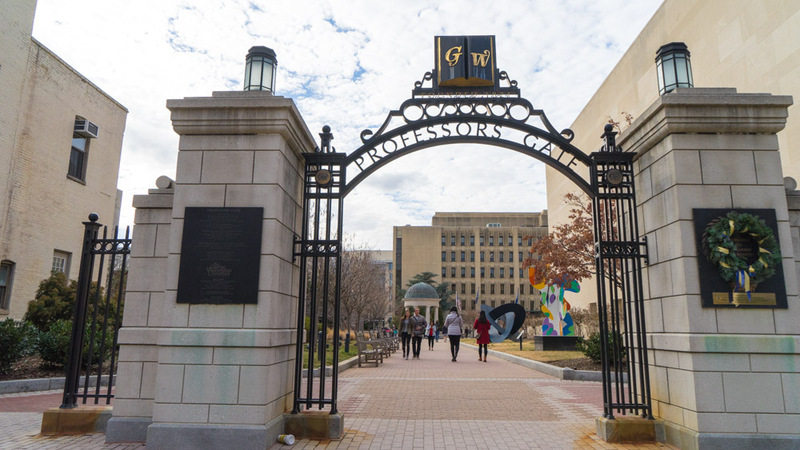 Are you a GWU student, parent or Alumni? Fill out this 2 minute survey to supplement our Daytripper University Guide for GWU!